In the last couple of posts, we studied two methods of adding rifling to barrels, namely Button Rifling and Hammer Forged Rifling. In this post, we will study a more modern method called Flow Forming. Flow forming is a relatively new technique of metalworking that was invented in the 1950s in Sweden. It is a cold forming process that is used to make round seamless hollow components to precise dimensions. As it turns out, barrels are round (well, except for polygonal barrels, which can't be manufactured by this method naturally), seamless and hollow, so they fit the requirements to be manufactured by this process. In flow forming, a hollow metal blank cylinder is slid over a mandrel made of some high tensile material. The metal blank is shorter and thicker than the final product. The outside of the mandrel has a negative image of the grooves, i.e. it has the raised groove reliefs carved on the outside. 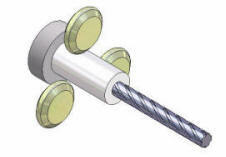 In the above figure, the mandrel is the thin purple rod with the screw thread on the outside of it. 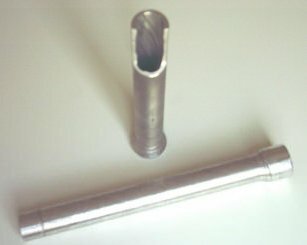 Note that the mandrel is inserted into a metal cylinder blank that is initially much shorter and thicker than the final shape. Also note the three green rollers around the workpiece. The mandrel and the metal blank workpiece are rotated and then the three green rollers apply pressure to the workpiece using hydraulics. 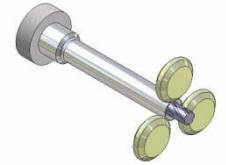 The rollers are slowly moved outwards using CNC (Computer Numeric Control) to achieve precise dimensioning. Since the metal is compressed beyond its yield strength, it starts to flow and become longer and thinner. It also gets the impression of the rifling impressed onto its inside. In the image above, you can see the green rollers being pressed onto the workpiece and you can see how the workpiece begins to elongate. The rollers deform the workpiece and lengthen it axially and also radially thin it simultaneously. The rollers may be applied back and forth over multiple passes to elongate the metal workpiece to the desired length and diameter. As you can see from the above pictures, the finished product has a very high quality finish and a well defined set of rifling grooves. The original blank was 1/3rd the length of the finished piece and the whole process of elongating and rifling the metal blank to the piece shown above took only 30 seconds or so. As you may suspect, even though the process is cold-forming, the application of pressure by the rollers tends to heat up the workpiece and hence a coolant fluid must be applied to the workpiece during the process. The finish is excellent and dimensional accuracy is very high. The speed of manufacturing a raw metal blank to a final product is less than a minute. The hardness of the blank is increased by this process, similar to how Hammer Forging changes the hardness of the blank as well. Reduces the number of future operations to the barrel. For example, there is little to no grinding and polishing that needs to be done to the barrel, since the finish obtained by this process is so good. Since the rollers are applied to only a small section of the piece at a time, the pressure is very localized and there is sometimes a net savings of energy compared to other processes. 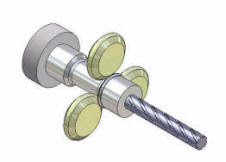 Materials such as some grades of stainless steel, that are difficult to machine in some other techniques can be machined using this method. The equipment tends to cost less than Hammer Forging equipment, but not as cheap as some of the other methods we've studied previously. The other issue to watch out for is that this method generates a lot of heat due to deformation and friction and hence, coolant fluid must be used to keep the workpiece cool during the process. 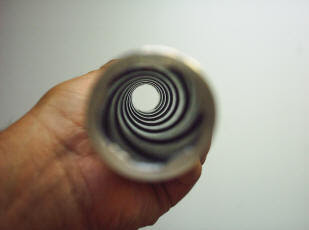 This technique is a modern way of manufacturing barrels and is gaining popularity in some sectors of the industry.